What am I supposed to do at a visitation? 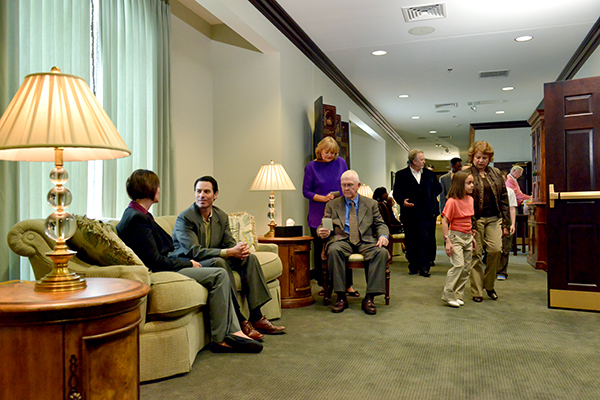 A visitation is an opportunity for friends and family to gather in honor of a loved one. 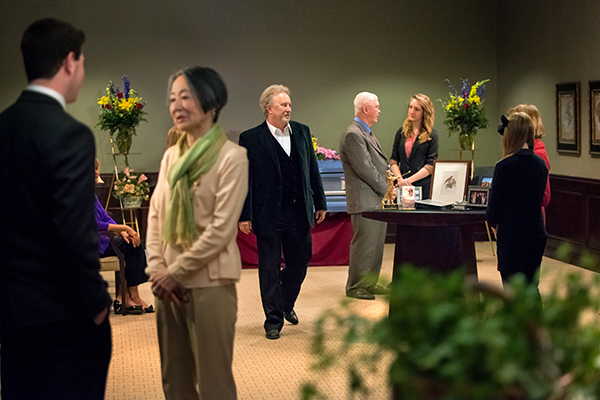 It’s common for a family to have both a visitation and a funeral service. While a funeral service is traditional in nature, a visitation is a more informal gathering generally held in the afternoon or early evening the day prior to the funeral service. People typically flow in and out of the space to pay their respects. Visitations can take place in any number of places, with the most common being a funeral home or church. Your main purpose in attending is to offer support to the family and close friends of the deceased. While both funerals and visitations can be somber occasions, it is perfectly acceptable to share light-hearted stories and memories at the visitation. When attending a visitation it is best to dress conservatively. While most people typically wear black or other dark colors to anything funeral-related, that is not necessary. What you wear should be subdued, unless otherwise requested by the family. The key is to avoid calling attention to yourself through whatever clothing you choose. This is about showing respect to the family and close friends of the deceased. Make sure you know when the visitation is scheduled to begin. You don't want to show up too early or late. The time is typically listed in the obituary, but you can also call the funeral home and ask. There is no requirement for how long you should stay at a visitation. The length of your visit depends more on how well you know the family and how long it takes to offer your condolences and speak to other visitors. Many people stay a short time, about 15 minutes, which can be long enough to extend your sympathies. Upon arrival you should offer sympathy to the family. If you are at a loss for words, simply saying, “I’m sorry for your loss,” is appropriate. If you were close to the deceased but do not know the family, you should introduce yourself. If you are close friends with the family, you may have more heartfelt words to say. Be sure to keep your voice low and avoid outbursts of crying or laughter. Each visitation can be different depending on the religion, customs and wishes of the family. Sometimes there is a viewing during the visitation, giving those who want to pay their last respects a chance to do so. Viewing the loved one is an option but not necessary. If you do, don't linger very long at the casket. It is important to sign the guest book so the family has a record of who attended the visitation. If you choose to send flowers, they should be delivered ahead of time so they are displayed during the visitation and/or funeral service. There will also be envelopes available should you consider making a monetary donation on behalf of the loved one. Attending a visitation is a great way to provide support to the family in a casual setting. It also allows you to express your condolences if you are unable to attend the funeral service.